This morning I stopped by Steel Bridge on my way in. 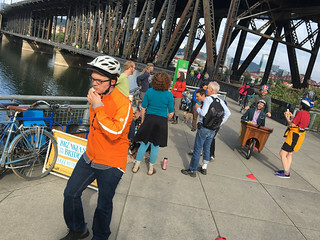 It was a bustling scene with people streaming by on bikes and on foot while several groups of people enjoyed coffee and conversation overlooking the Willamette and downtown skyline. It was a wonderful way to start the day. Boaz Frankel (in the cargo box) and Phillip Ross from the Pedal Powered Talk Show where there passing out Bike More Challenge prizes. During June the B on B crews will be out in force every Friday of the month. Next time you see them, pull over and stop for a spell. If you end running late they’ll even give you a tardy slip. 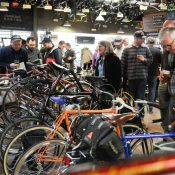 To learn more, read our recap of the 10-year Breakfast on the Bridges anniversary party, peruse our archives, and follow @bonbpdx on Twitter. 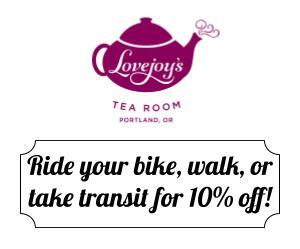 We’re pretty lucky here in Portland! We’re lucky because we’re GOOD. Always a nice perk…if you commute across the river…on the right bridges. Seems like kind of a narrow view to take. I’ve never once participated as I don’t commute across these bridges to work, but I love that it happens all the same. I always stop for these and end up chatting with people for a while about bikes! Definitely worth being late to work for! 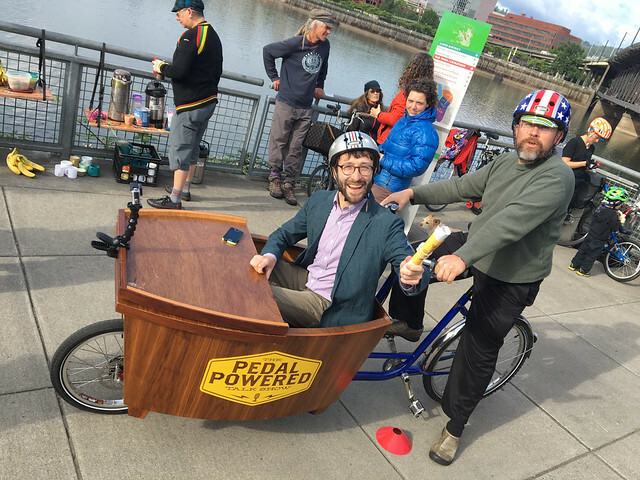 Like everything Shift makes happen (Pedalpalooza and the World Naked Bike Ride included), the goal is simply to have fun and meet people. political advocacy/activism is both fun and a good way to meet people. Is it at all 3 of those bridges each time, or does it rotate? 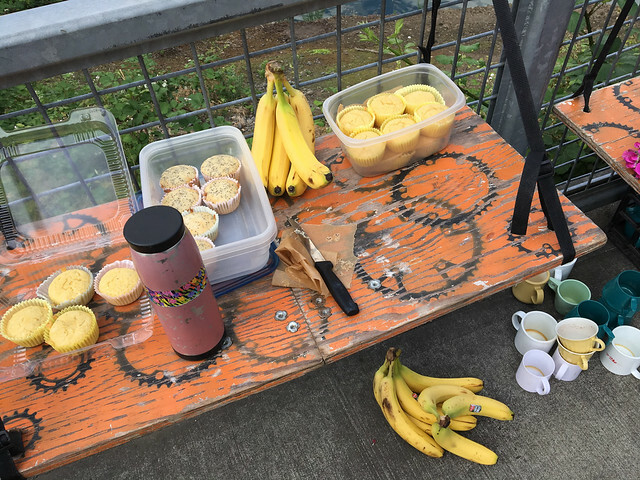 On most years, there is a breakfast event in May (one year in December) at the Burnside bridge over I-205, sponsored by EPAP, ODOT, PBOT, and others. Usually 75 bicyclists pass by, and 30 stop to chat. 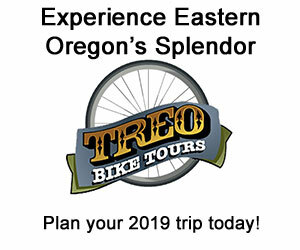 While I’m a supporter of cool/fun bike things, I have a minor criticism of this event that happens at the east side connection to the Steel Bridge lower deck. It’s a bit of a hazard for those attempting to cycle through the area due to the bottleneck created by the booth and hanger-arounds. If they shifted over towards the stairs a bit and made it easier to maintain a clear path line to the lower deck and the east side esplanade it would be much better. I was thinking the same thing as I rode by, but then, honestly, I realized I’m a grump and folks can just slow down for a second. 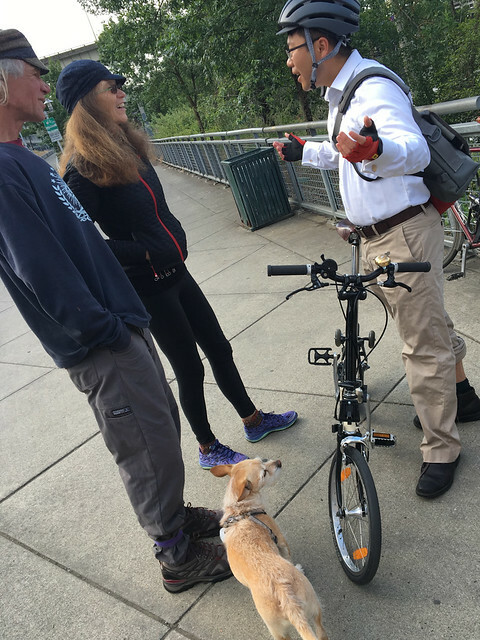 I got interviewed by KBOO for a bike podcast this morning at the B on B! I’ll keep you all in my thoughts once I achieve my fame and fortune from the celebrity this is sure to bring. What a great tradition! I don’t think Portland is Lucky, you are good! This creates such a great atmosphere of community around bicycles. Yes, it may jam up traffic a little on that last Friday of the month. 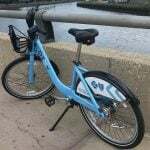 You may even get some people out there who only ride on the last Friday of the month! And that’s okay. You are creating awareness. You are creating excitement. You are creating delicious food! Keep it up Portland. Hopefully the rest of the country will catch up to you. I’m doing my part to push Boulder forward. 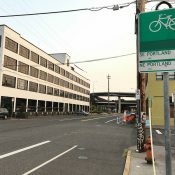 I certainly miss this every month on the Burnside Bridge. I wish it would come back! FYI, we are NOT going to be out every Friday this June. 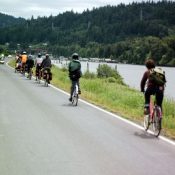 We are out every Friday during Pedalpalooza. So no BonB this Friday, June 3, yes BonB Friday July 1. 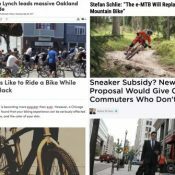 Please update the article?